While Goerke managed to salvage 4-4 motos, which saw him seal the top-five overall in fifth place, Epstein had to settle for a distant 14th overall. The Californian, who delivered an impressive third place finish in Moto 1, saw a sixth place start in Moto 2 evaporate on the first lap. Epstein was pushing hard to connect with the frontrunners when his front wheel hit something on the down side of a landing. This deflected him over the bars and to the ground, where he hit hard, leaving him unable to rejoin the fray. Although he is expected to race at the final round in Walton, this turn of events left him with only a slim chance to wrap up the season with a fifth place in the final points standings. Epstein currently sits in sixth place. He has enough points to his credit, however, to secure that position regardless of how he finishes in Walton. Goerke’s results, meanwhile, were good enough to maintain his current fourth place points standing. With 372 points, he sits seven points down from third place Kaven Benoit; five points up from fifth place Tyler Medaglia. Mathematically, the Florida native could still finish the season with a No.2 ranking or even No.1 again, depending on how Cole Thompson and Colton Facciotti perform at the final round in Walton. Second in the points Thompson has accumulated 384 points. Facciotti sits at the top of the scoreboard with 406 points. Realistically, Goerke needs a clean sweep in Walton to keep the title for another year. 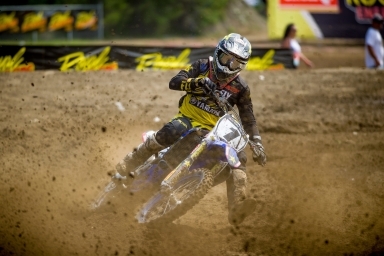 Facciotti and Thompson, however, will have to be the victims of a worst-case scenario in at least one moto. In Sunday’s action – Deschambault MX was the only venue to not run a national on a Saturday this season – the start of the first moto had all the usual suspects pouring on the gas to try and secure a position in the top five. Goerke and Epstein weren’t quite there, but close enough with a sixth and seventh respectively. By the halfway mark of the moto a hard charging Goerke was running in fourth while an equally hard charging Epstein had taken over third. They would hold those positions until the finish line behind second place Cole Thompson and first place Kaven Benoit. The second moto start saw both Goerke and Epstein in good position, with Goerke in third place and Epstein just behind him. By the second lap Goerke had been relegated to fifth, however, after he made an error and went down. Epstein, meanwhile, found himself the victim of Murphy’s Law. Goerke remained in fifth for most of the moto, hounding a super motivated Jacob Hayes, who was running behind Tyler Medaglia, Thompson, and leader of the pack Facciotti. It took till the final lap for Goerke to get by Hayes, which meant his fourth overall on the day was a done deal. “It was a rocky weekend for us and not the weekend we were looking for. But this is racing and we have to keep our heads up and look forward to Walton, after a week off. Points are still up for grabs and anything can happen,” team manager Steve Simms said. The Rockstar Energy Triple Crown Series wraps up on Saturday, August 18th, with Round 9 of the MX Tour at Walton Raceway in Walton, Ontario.